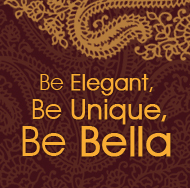 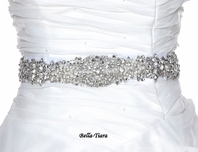 HOME / WEDDING ACCESSORIES / Belts Wedding Beaded Sashes / Mon Cheri designer all around beaded wedding sash J11234 - SALE!! 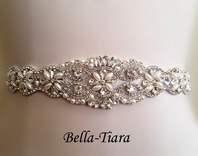 Description: JUST beautiful, design all the way around, Highlights of this design include three-dimension floral patterns of various sizes that include Swarovski crystals. 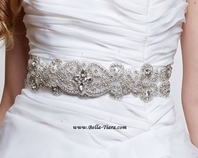 This wedding dress belt also includes hand-beading and other types of jewels. 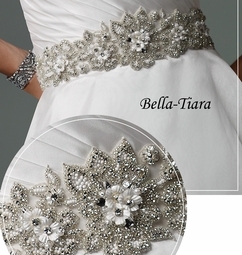 design goes all the way around, with hooks on the end which could be moved to ensure the proper fit. 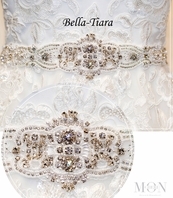 diamond white color suitable for white or ivory dresses, beading covers the elegant organza sash therefore color matches.